You need to have DOORS 9, DOORS Web Access, QM installed and integrated. In my environment I am using DOORS 9.6.1 and QM 5.0.2 deployed on a Windows 7×64 machine. In the screenshot below I have 2 DOORS 9 requirements “validated by” RQM test cases. 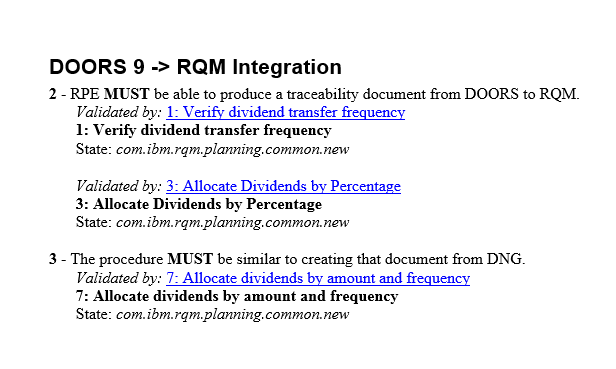 The procedure is identical to the one for creating traceability documents from Rhapsody to RQM. 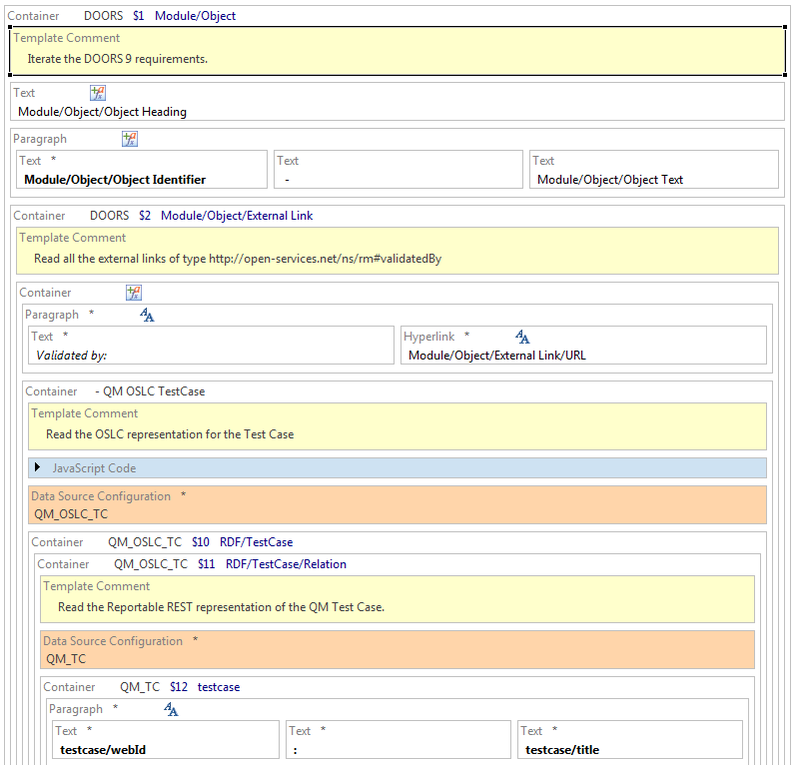 Actually for building the template for this article I have reused the QM_TC_Snippet.dta referenced in that article. Get the external links of type http://open-services.net/ns/rm#validatedByNOTE : The link is the OSLC URL of the test case which cannot be used directly for document generation. You need to get the Reportable REST URL first and this is what the next 2 steps do. The template is available on the RPE Developer Works Wiki Unclassified & Cross Domain Templates page. I tried to run your DTA but keep getting unconfigured data source error. I have gotten to the point where I am importing a REST v2 OSLC schema, however, RDF/TestCase/Relation is not an option in my imported schema. I am authenticating with Basic Authentication and using the default query capability for TestCase. Shouldn’t there be a relation option? When I try to use form or OAuth authentication, I get two different error messages. For form authentication, I get ‘Response message: Unauthorized’. For OAuth authentication, I get ‘Can not access to the OAuthentication URL’. What URL did you use to generate the report? Did you finally find the solution? I ‘m trying to build a report involving Rational DOORS Requirements and RQM Test Cases and I’m facing the same problems you mentioned. I loop through all the requirements in the module and extract the external links. Then I import the Rest v2 schema selecting Test Case capability but no relation option appears in the schema so it’s being imposible for me to reach Test Cases at the moment.